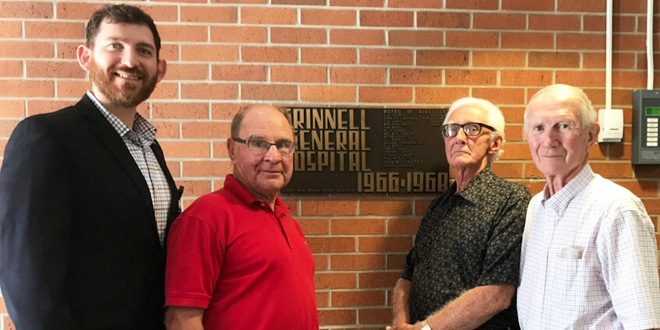 From left, Kyle Wilcox, Rick Ramsey, Frank Chrisben and Wayne Gedelmann stand by the plaque at the original entrance of the Grinnell General Hospital. UnityPoint Health® – Grinnell Regional Medical Center welcomed faces from the past in July. Frank Chrisben, first hospital administrator of the 1967 merged Community Hospital and St. Francis Hospital, stopped by GRMC along with Richard Ramsey, retired businessman. Chrisben received an update about the latest merger of GRMC and UnityPoint Health – Des Moines from Kyle Wilcox, GRMC vice president of finance and business development.